More than 15 ancient cooking hearths unearthed in Alaska are turning up surprising new clues about the lives and diets of Sub-Arctic hunters during the Ice Age. The fire pits have been found to contain an abundance of salmon remains, archaeologists say, and the oldest of the pits — dated to at least 11,800 years old — has revealed the earliest evidence yet of salmon cooking in the New World. Finding salmon in Alaska might not sound surprising, even if it is almost 12,000 years old. “Our results demonstrate that salmonid and freshwater resources were more important for late Pleistocene hunter-gatherers than previously thought,” the team writes in their report on their findings, in the Proceedings of the National Academies of Science. Archaeologists have turned their attention to the cooking pits, because new technology is allowing them to study the charred contents, which can provide direct evidence of meals that were eaten millennia ago. “[H]earths … can provide valuable evidence for ancient subsistence practices, particularly when faunal remains are not preserved,” the team notes. Archaeologists excavated a total of 17 cooking pits that ranged in age from 11,500 to 13,200 years. The researchers then used a technique called stable isotope analysis to study the chemistry of charcoal samples from each of the pits. This method reveals the concentrations of various chemical isotopes, each of which can be traced to certain types of food. Higher levels of the isotopes nitrogen-15 and carbon-13, for example, are indicative of the fats found in marine fish, like anadromous salmon, whereas freshwater fish and land animals have lower levels of these chemicals. 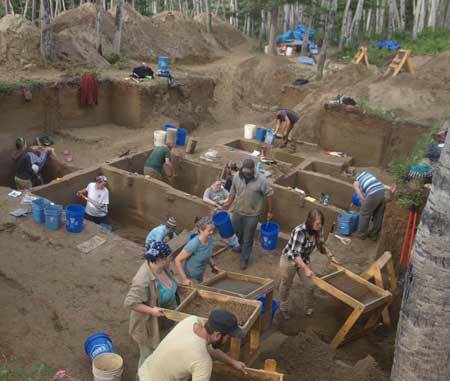 “It’s quite new in the archaeology field,” said Kyungcheol Choy, the University of Alaska-Fairbanks researcher who led the study, in a press statement. The analysis revealed that, unexpectedly, 10 of the 17 hearths contained the unique chemical signature of salmon fat — specifically, that of chum salmon, also known as keta. The researchers also found that the evidence of salmon cooking was most abundant around 11,800 years ago — the oldest such evidence on record in the Western Hemisphere — and again about 11,500 years ago. These findings open up new insights not only into the eating habits of the people at Upward Sun River, but also into their culture and customs. “This is a different kind of strategy,” said Dr. Ben Potter, University of Alaska anthropologist and co-author of the study, in a press statement. For example, the fact that 10 of the hearths contained consistently high levels of salmon residue, while the others contained evidence of freshwater fish and land animals, suggests that separate pits were used for preparing different kinds of food, consistently over the course of thousands of years. Potter and his colleagues had previously reported on another compelling discovery made at the site: the grave of two infants buried inside a residence some 11,500 years ago, as well as the cremation of a third child. 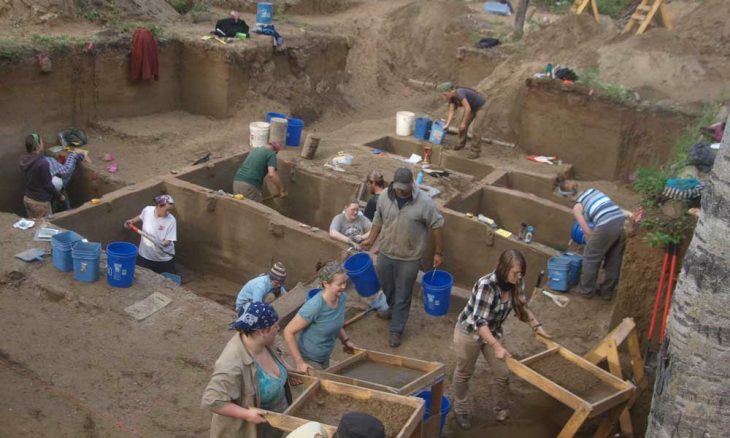 The new discovery of the hearths and their contents adds greater detail to archaeologists’ understanding of how the people of Upward Sun River lived, as the period of the Ice Age, known as the Pleistocene, was transitioning into the epoch we live in today, the Holocene. “Collectively, [our] data indicate patterned, recurrent use of the area for seasonal anadromous salmon fishing and processing and that aquatic resources were more important than previously thought during the Late Pleistocene-Early Holocene transition,” the team writes. 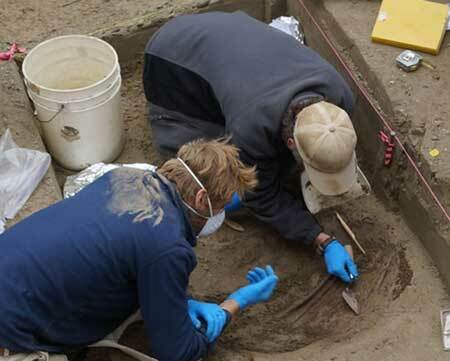 The experts also add that isotope analysis and other chemical studies can give archaeologists a new suite of tools for understanding the past. “Our findings reveal that analysis of organic residues from hearth sediments can have great utility for reconstructing dietary trends and subsistence practices among mobile hunter-gatherers, particularly in contexts where faunal remains are poorly preserved,” they write. “It’s an awesome look at how we can merge disciplines to answer a question,” Potter added in the press statement.